When it comes to the fun side of 3D printing, we’ve written about 3D printed guitars, mini custom robots, and even 3D printed high fashion when we told you about the first 3D printed bikini. Well, here’s another example of the lighter side of 3D printing that is perhaps a little more in tune with the interests of the Design News audience — a 3D printed board game for serious strategy gamers. Ill Gotten Games got its start when its co-founders Arian Croft and Jeremy Larsen decided the best way to find role-playing games and board games that met their incredibly high standards was to design them themselves. Since many games in this category typically command price tags of upwards of $60 to $100, the combination of 3D printing and open-source 3D modeling became Ill Gotten Games’ route for developing and bringing like-kind games to market in a far more cost-effective fashion. 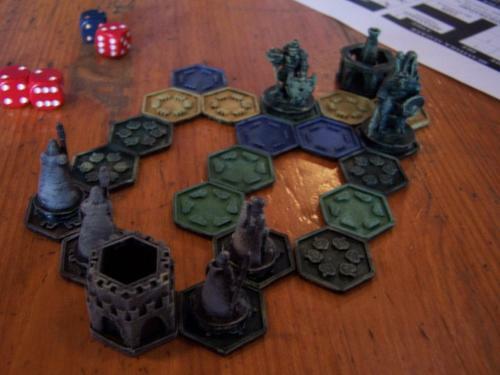 The plastic pieces that comprise the Pocket-Tactics strategy game are designed as 3D models in Tinkercad and SketchUp and can be outputted by any 3D printer. The pair describe Pocket-Tactics as a tile-based strategy game in which fantasy forces battle for control of the world. They say the game takes between 20 and 45 minutes and is small, meaning that the pieces fit inside a small felt bag, and the play area only takes up a little more than a foot of table space. Here’s where things get interesting. To get the game, in which the Legion of the High King battles against The Tribes of the Dark Forest, would-be players go to Thingiverse (3D printer manufacturer Makerbot’s community where enthusiasts share 3D designs for output for physical models) to download both the game rules and instructions, as well as the 3D models for the actual board pieces — all of which are free. The Ill Gotten Games team designed the board game pieces using free 3D CAD tools, including SketchUp and TinkerCAD, and, in keeping with the spirit of the open-source community, is inviting fellow strategy game hobbyists to wade in with ideas for future games and board designs. For those who don’t have access to a 3D printer, the Ill Gotten Games crew is planning to offer a fully 3D printed version of the game for purchase on Etsy, which is an e-commerce site specifically tailored for really small businesses and manufacturers to sell their wares. Sure, 3D printed board games are certainly nowhere near as complex as preparing an industrial part or full product design for 3D printed output. But the concept does go a long way in showcasing how the combination of open-source design tools and more accessible 3D printing resources is giving small innovators an edge in bringing products to market faster and without requiring a huge capital investment in manufacturing and tooling.